Join U.S. Senator Amy Klobuchar and over 40 co-hosts at a reception for the re-election of Minnesota State Representative Ron Erhardt. If you can’t make it to the event, Amy and Ron would still appreciate your donation to ensure that Ron is re-elected to the MN House of Representatives this fall. 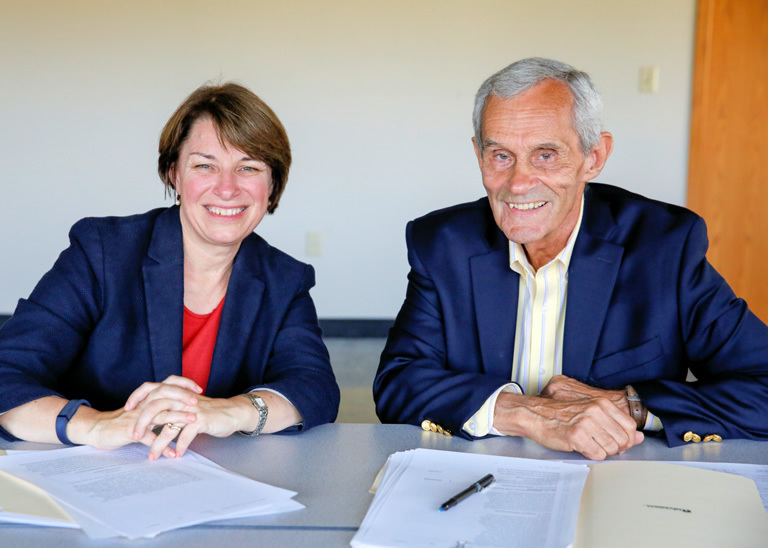 Ron’s legislative presence, knowledge and skills are very valuable to Edina and Minnesota. Ron’s committee can accept contributions up to a total of $1,000 per person or $2,000 per couple for the 2015-2016 election cycle. We cannot accept contributions from Political Action Committees or registered lobbyists, but we can accept contributions from their spouses and family members. You may donate up to a total of $1,000 individual or $2,000 couple to Ron Erhardt’s campaign during the 2015-2016 election cycle. We are required by law to record your Occupation and Employer in order to accept your donation. If you are not employed, please enter some descriptive term(s) for Employer and Occupation, such as ‘N/A’, ‘retired’, ‘homemaker’. If you list “Self Employed” please describe what you do. When Donating as a Couple, we are required to get both names, both occupations, and both employers. You can do that with a “/” to separate. If you have already donated your 2015-2016 maximum to the Erhardt Volunteer Committee, please call or email the Coordinator. You will receive a receipt for your donation and our coordinator has been notified. Thank you. It will be a wonderful, unique afternoon. Questions? Need to talk to someone or want to discuss your reservation(s) in person? 4214 Sunnyside Rd, Edina MN 55424 and not by Senator Klobuchar or Co-Hosts.